One of the great things about my neighborhood is every time I start to think I'm tired of living here, the restaurant situation evolves and it's like food-wise at least, a new neighborhood comes to me. 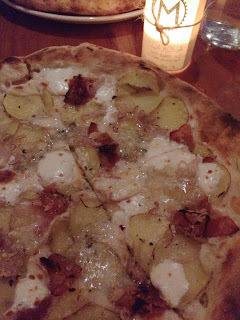 The newest of the new crop is Macchina, a fancy pizza place that just opened at the corner of 105 and Broadway. The decor is modern, with lots of brick, maybe a little retro/hipster/cliche, but it's got great windows that open up when the weather's nice. The service was great, and most importantly the pizza was very good. They've got the crust down (very Italian style, whatever they've got going on oven-wise, it gets fantastically hot). This is a pizza bianca with thinly sliced potatoes, bacon, and gorgonzola. A great combination of flavors. We also got the carrot 'agnolotti' which was tremendous--it's great that people have recently discovered how to roast carrots to the point that they're almost like meat. Root veggies in that form are on the verge of being overplayed in NY restaurants at the moment, but that doesn't stop a well prepared carrot from being delicious, and here, in a pasta setting with amaretti, mint, hazelnuts, and brown butter...well, who needs the flesh of an animal? Macchina has taken some hits in the early Yelp reviews for being overpriced for the neighborhood, and overpriced for pizza. I think the criticism is justified to an extent, but, hey, they post the prices publicly, if you opt to eat there, I don't think it's fair to get upset later about how much your pie cost. My slightly larger problem with Macchina is that the menu, though good, is pretty limited. Four white pizzas and four red pizzas to choose from (plus some pastas and a few 'secondi'). I realize they're just getting started, but any corner pizza shop in the city can put together more combinations and permutations of ingredients than Macchina has. Hopefully as they hit their stride the menu will get more diverse. Still, I'm psyched to have them around, looking forward to trying more of their offerings.